Diebenkorn's first Ocean Park painting was completed before the end of 1967, although no drawings of the subject appear to date before 1970. Like the present drawing, the earliest of these are very spare and schematic, and rarely contain color. Diebenkorn began working on the series when, in 1966, he attended the Matisse retrospective exhibition in Los Angeles and was struck by two pictures: Open Window, Collioure (1914; coll. Muse National d'Art Moderne, Centre Georges Pompidou, Paris), and View of Notre Dame (1914; coll. The Museum of Modern Art, New York). These paintings proved to Diebenkorn that the representational could be alluded to in the abstract and inspired him with a new way to reveal subjects. Several years earlier, in 1956, Diebenkorn had turned away from the abstract style in which he had been painting since the early 1940s and favored representational subjects. With renewed inspiration in 1966, he once again began exploring the abstract. In drawing the Ocean Park area of Santa Monica, he focuses on the panoramic aspects and glowing luminosity of the California landscape and Pacific Ocean. Diebenkorn, as John Elderfield has noted, "is not the kind of artist who seeks to expose some hidden reality behind the reality of things as they are. In this respect, his method differs from Matisse's as well as Mondrian's; it is closer to Czanne's. 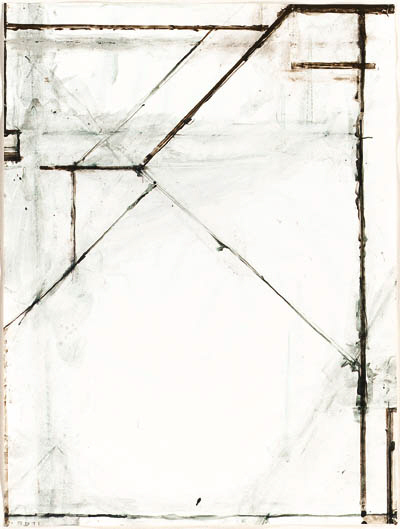 For Diebenkorn, as for Czanne, reality is external and visible and exists in its particlar aspects." (The Drawings of Richard Diebenkorn, exh. cat., The Museum of Modern Art, New York, 1988, p. 40).